Shaw Wu with Sterne Agee issued to investors Friday in which he declared that iCloud will make it even tougher for companies to compete with Apple. He reiterated his belief that iCloud will "change the game" in the highly competitive mobile space. In his view, iCloud will make iTunes even more powerful and useful for end users. That would be a huge blow to RIM, Google, Amazon and Microsoft, all of which have struggled to compete with iTunes in its current form. But iCloud is predicted to have a particularly significant impact on RIM, which offers its own unique push network for users of BlackBerry smartphones. "While iCloud doesn't replicate all of RIMM's push network, the ability for iCloud to offload data center processing and traffic from carriers is attractive," Wu wrote. "And it looks like AAPL will likely offer some base service for free." Citing industry contacts who shared details on the matter, Wu said that Apple's iCloud is likely to impact both RIM's forward service revenue and gross margin. This is because carrier payments are estimated to have a high gross margin of 85 percent to 87 percent. As a result, Sterne Agee has lowered its estimates and price target for RIMM stock. For the company's 2012 fiscal year, Wu now sees $24 billion in revenue and $6.35 in earnings per share, down from $24.1 billion revenue and $6.65 EPS. And the new price target for RIMM stock is set at $44, down from $52. Though the iCloud name has been confirmed by Apple, the actual details of the product remain unknown. 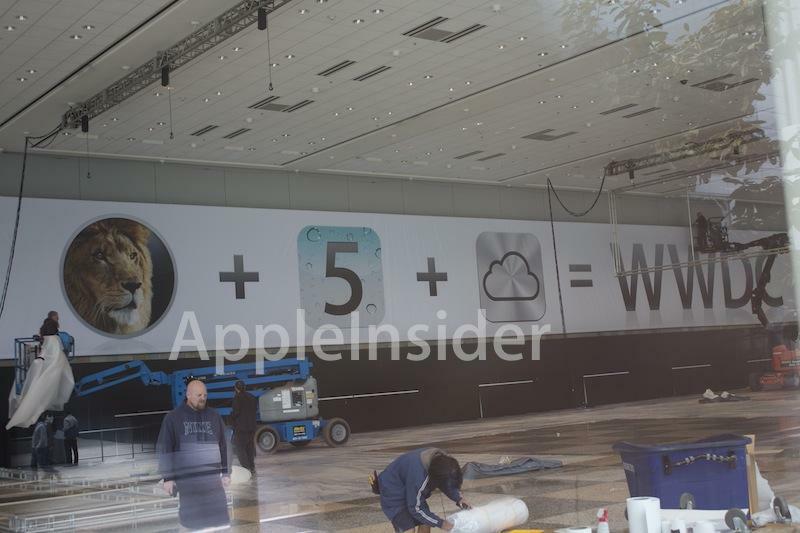 Chief Executive Steve Jobs is set to unveil the new service during his keynote that will kick off the Worldwide Developers Conference on Monday, but banners hung at San Francisco's Moscone Center have already shown the company's iOS icon for iCloud. On Wednesday, AppleInsider exclusively reported that iCloud is expected to offer some services —likely syncing of bookmarks, contacts and calendar events —free to users who run Mac OS X Lion, Apple's latest Mac operating system. The iCloud service is believed to replace the current MobileMe product. Other reports have indicated that the music streaming component of the new iCloud service could be free at first in a trial period. But eventually, Apple reportedly plans to charge customers $25 per year to be able to stream their content to any Internet-connected device, such as an iPhone or Mac.